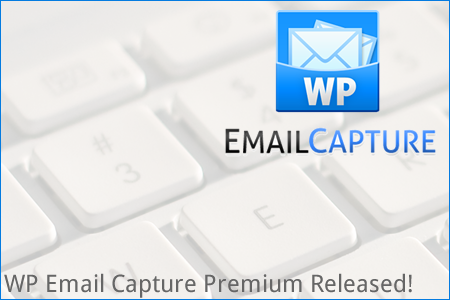 Today, I am delighted to announce the launch of WP Email Capture Premium. Autoresponders – send new subscribers emails. These can either be reminders on what they are subscribing to, or exclusive content such as a course. Stat Tracking – Track where visitors to your site arrive from. This can help optimise your marketing efforts for your blog. Multiple Lists – You can create multiple lists, each with their own landing pages, confirmation pages and autoresponders. These lists are separate from each other, so you can edit and delete each list independently. You can separate lists by stats. Greater Control of the Look of the Form – Greater control of the look of the list via CSS, easy image buttons, and 3 predefined templates. This is the basic extra features, however there is much more you can do with WP Email Capture Premium. There is also exclusive content, for example, on the WP Email Capture website that is only available to purchasers. Right now, you can purchase WP Email Capture Premium for $49. This early-bird price is for a lifetime of upgrades and a lifetime support (providing via the WP Email Capture Support Ticketing System). Can you afford not to purchase it? As a Blogging Dojo reader, you can get 10% off the price, using the code DOJOCAPTURE10. Want to earn upto $30 per sale? I am offering an affiliate programme via E-Junkie. If you wish to find out more and how to sign up, as well as get access to creatives and exclusive content, please click here.